Given that this thread is about the possibility of planetary expansion, I thought it would be a good idea to create a reasonably kosher account of our current state of knowledge of the earth's interior, and the crust and mantle in particular, known collectively as the Bulk Silicate Earth. I have to apologize for the haphazard nature of some of the discussion and for harping on about some features, but because of the way the account is structured (descriptive framework first then description plus a bit of idle speculation here and there and at the end) and the interrelated nature of the subject it is difficult to avoid jumping around and repeating some points. I originally planned to work out from the core but as our descriptions mostly take a top down approach I was obliged to fall into line, so to speak. See the concluding remarks for more on this subject. The outer region of our planet, the Bulk Silicate Earth (BSE), is thought to to be composed of layers. The stratification or differentiation of this region of the earth is a major feature and forms the basis of descriptions of its morphology, that is, its form and structure. The reasons for this layered structure are much discussed and investigated. Note also that layered structures appear over a wide range of scales. As the name suggests, silicate is the main component and oxygen is the main component of the silicate. These layers are preceded by the hydrosphere/atmosphere and followed by the inner/outer core. The layers are distinguished by variations in one or more of the following categories. 1. Elemental composition. Elements are classified according to the number of protons in their atomic structures, the protons reside in the nucleus of the atom along with neutrons. There are about one hundred known elements and the earth contains all of the naturally occurring ones in varying proportions. Examples are hydrogen, oxygen, iron, carbon, mercury and so on. 2. Mineral content. The elements are combined into various chemical compounds called minerals which, nearer the surface at least, are generally crystalline in nature (that’s where the mineral components have an ordered periodic structure), but occasionally they are amorphous (i.e, no crystal structure, like for example, glass, or indistinct, like talc). The size of the crystals can vary from very large to microscopic. There are about 5000 different minerals. They can occur as separate deposits or combined with other minerals as rocks. And it just so happens that the majority of the mineral volume of the BSE is composed of various types of silicates (silicon oxides which are a combination of the metal Silicon and the gas Oxygen) with other metals, for example, magnesium silicate or aluminium silicate. 3. Rock types. Rocks consist of different combinations of minerals. Examples of rock basalt or sandstone. The minerals that constitute the rocks are generally crystalline. The rocks are divided into three separate groups, igneous (intrusive or extrusive), metamorphic and sedimentary. These categories are based on what are thought to be varying formation conditions and origins. However, like the layers of the earth themselves, the boundaries between these rock groups are sometimes blurred. There are a few hundred different rock types spread over the three principal classes. 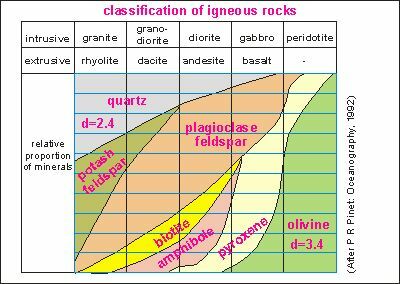 The most abundant rock types are the igneous rocks which are presumed to have solidified from a magma (a body of molten rock). The magma can take the form of subterranean lakes, layers, plutons, plumes, pipes and dykes. Magma appears on the surface as sheets of basalt (usually), as exposed dykes or as volcanic ejecta. The magma interacts with the rocks with which it comes into contact, to the extent that some of the host rock becomes incorporated into the magma and transported elsewhere. The interaction can also modify the mineral structure and content of the host rock. The magma composition can vary depending on the source of the magma itself. Most is considered to have a mantle zone origin (often influenced by subducted crust and its accompanying sediment and water – the water enables the components to liquefy at a lower temperature than would otherwise be the case), while others such as granite magmas may have their origin in reworked sediments. The magma is thought to be enriched in lower melting point elements as it solidifies leaving heavy metal rich silica structures either as disseminated or veined deposits in the solidified magma or the surrounding host rock. Diffusion and fracking are the operative processes. Sedimentary, (includes evaporites and hydrothermal limestone and metal sulphide deposits). They usually have a layered structure and often display varves which suggest an advancing front of deposition which is typical of deltaic sediments. Sedimentary deposits can be regionally extensive and thousands of meters thick. The majority of sedimentary rocks are considered to have a detrital origin, i.e. transported by water (including glacial activity), wind or gravitational collapse to the site of deposition. Others are thought to have been deposited by evaporation or by hydrothemal activity. The carbonates (e.g. limestone) are considered to have a biological origin, however recently a hydrothermal carbonate has been identified where the source of the carbon is ocean floor methane seep. These Methane Derived Authigenic Carbonates (MDAC’s) occur as ocean floor structures or as subsurface features that can be identified in seismic surveys. Metamorphic. These are originally igneous or sedimentary rocks that have been altered as a result of exposure to high temperatures and pressures (high energy) environment either as a result of burial by subduction, overturning or sediment overburden accumulation. Metamorphism can also occur as a result of coming into contact with intrusions of some kind either as dykes or plutons (a large subterranean magma blob). Other tectonic action uplifts them to near the surface where they outcrop. They are the source of much of the worlds supply of non-ferrous metals. These rocks, when they return from their journey to the underworld, are highly altered and deformed and sometimes enriched with heavy metal sulphides etc. An example of a common metamorphic rock is slate. ii. 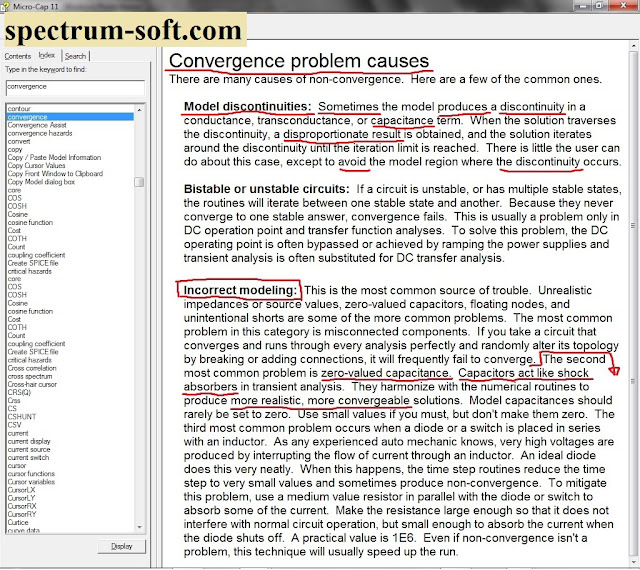 How the energy is transmitted, the nature of these flows/transmissions including electromagnetic and acoustic (seismic) activity, mantle flows/plumes, convective or otherwise. iii. Its effects, e.g. tectonic activity/earthquakes, deep earthquakes (non-tectonic), vulcanism, radioactivity, optical properties. iv. The phases or states of the components (solid, liquid/gel, gas, plasma or maybe even some high temperature/pressure analogue the fifth state of matter, Bose-Einstein condensates). Aspects of these categories are referred to where appropriate. The following is a list of the layers and discontinuities of the BSE from the surface down. They generally follow one another but sometimes they overlap other recognised boundaries. Estimates of the size of the layers vary but the figures provided give a rough idea of their extent and order in which they occur. Layers and boundaries can be distinguished by variations in seismic wave transmission paths and velocities whereas the composition layers are inferred from a study of what is thought to be mantle type rock exposed on the surface, stony meteorite composition, high temperature/pressure studies of various elements, compounds and minerals, and gravitational surveys. Crust, there are two types, oceanic crust 5-10 km thick which covers two thirds of the earth’s surface and is generally less than 150 million years old. The remaining one third is continental crust which is up to 70 km thick and up to 4.5 billion years old. Conrad discontinuity, observed in some continental regions at a depth of 15 to 20 km, however it is absent in some continental and in all oceanic regions. Unlike the more well known Mohorovicic discontinuity, it is somewhat indistinct, and it may be related to the 19th century notion of dividing the crust into an upper felsic sial (silica-aluminium) region containing rocks such as granite, and the lower magnesium-rich mafic sima, for silica-magnesium rocks consisting of andesiticic type rocks. See below for more on the mafic/felsic classification. Brittle to ductile transition zone. It is the strongest part of the Earth’s crust. For the felsic rocks in continental crust it is located at an approximate depth of 13–18 km (roughly equivalent to temperatures in the range 250-400°C). At this depth rock becomes less likely to fracture and more likely to deform by creep. Many earthquakes occur in this region. Mohorovicic discontinuity (Moho), it is located about 5-10 km below the ocean floor, and 20-90 km (average 35 km) beneath continental crusts. 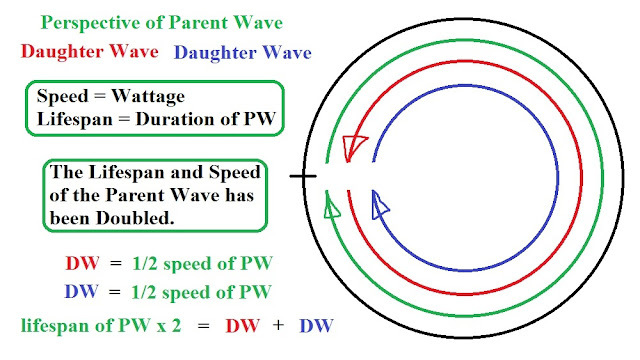 It is characterized by an increase in primary seismic wave (P-wave) velocity from about 7 km/sec to about 8 km/sec. It is suggested that it marks a change in rock type from basalt to peridotite, however it is a very regular interface and other observations suggest that such a variation in rock type would have a more uneven boundary. The Moho is characterized by a transition zone of up to 500 m thick. The P-wave velocity range for basalt is 6.7–7.2 km/s and for peridotite or dunite it is 7.6–8.6 km/s and as they do not overlap this makes for a sharp boundary. Lithosphere, defined to be the rigid outer layer, it includes both the crust and the upper portion of the mantle, and is about 150 km thick. This region, like the asthenosphere mentioned below, is a mechanical classification. The lithosphere is the province of tectonic plate activity where the layer of ocean basin rocks, down to the base of the lithosphere, are thought to be continually recycled via a process which is a combination of subducting old cold ocean crust and its replacement with new material introduced via mid ocean ridge spreading. The energy source for this process is not well understood. 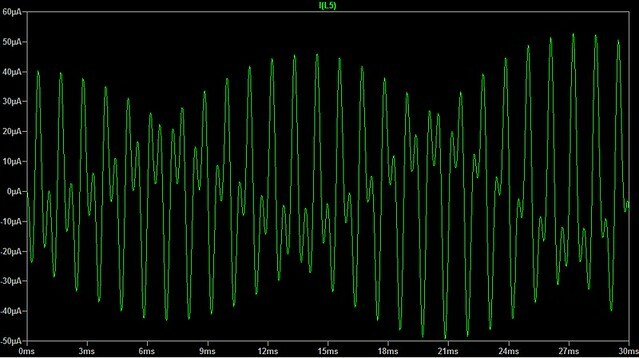 Lehmann discontinuity, like the Conrad discontinuity, a somewhat ephemeral feature that manifests as an increase in P and S wave velocities at 220±30 km. It is present below continental crust, but is much rarer beneath oceanic crust, and is not readily apparent in globally averaged studies. Upper mantle, the first 400 km of the mantle. It is composed of the magnesium-iron silicate variants, olivine, pyroxenes and garnet. It plays host to magma formations and is believed to be penetrated by more dense sinking cold oceanic crust/top of the upper mantle combination (lithosphere). The regions where this occurs are located at plate boundaries and are called Wadati-Benioff or subduction zones. This process introduces water to the region and so enables the creation of shallow magma bodies that can make their way to the surface and manifest as volcanic activity. Volcanic activity that is not related to subduction zones, for example in the Hawaiian islands, produces only the mafic basalt and has a much smaller amount of volatiles. These intra-plate volcanos are thought by some to be the result of plumes of positively buoyant mantle material ascending from deeper in the mantle. Middle mantle or Transition layer, about 250 km thick, it extends down to about 650 km. It is thought to be composed of yet more magnesium-iron silicate variants, spinel and majorite. The lower boundary roughly coincides with the limit of deep earthquake activity. The boundaries between the layers is usually thought to be uneven, rising here and falling there as conditions dictate. The deep earthquakes may be related to sudden alterations in the location or condition of the boundary layer. Asthenosphere, this is the other mechanical layer classification, it extends from the lower boundary of the lithosphere down to the lower boundary of the middle mantle which, as stated above, is at a depth of about 650 km. It thought to be a region composed of very viscous, mechanically weak, ductile mafic material. And its lower boundary roughly coincides with the depth limit of deep earthquakes. Lower mantle, extends from about about 670 km to 2,700 km. Thought to be composed of yet another magnesium-iron silicate variant, silicate perovskite (Mg,Fe)SiO3 (also known as bridgmanite) combined with calcium silicate (CaSiO3) and arranged in a perovskite structure. Together with ferropericlase, which is the oxide of the ubiquitous magnesium and iron ((Mg,Fe)O), these minerals are thought to be the stable mineral phases of this region. Spin transition zone. Changes in the spin state of electrons in iron in mantle minerals have been studied experimentally in ferropericlase. … Results indicate that the change from a high to low spin state in iron occurs with increasing depth over a range from 1000 km to 2200 km.The change in spin state is expected to be associated with a higher than expected increase in density with depth. ‘D’ layer, the last 150-200 km of mantle, between 2700 and 2900 km with a base temp of 2200 C, thought to be composed of a another in the perovskite sequence, post-perovskite and ferropericlase which is the stable phase at the temperatures and pressures encounted at those depths. Note: The seismically reflective inner core boundary, known as the Bullen discontinuity, is also sometimes referred to as the Lehmann discontinuity as it was first observed by Lehmann. Confusing, no? ?? This diagram, courtesy of Britannica, shows how the mechanical classifications overlap the compositional layers. Reiterating a couple of points mentioned above, the bulk silicate earth includes both the mantle and the crust. It extends from the surface to the core/mantle boundary. And the seismically identified boundary region between the mantle and the core is found at about 2600 km below the surface and is known as the ‘D’ layer. In contrast to the mainly iron core, the BSE consists mostly of oxygen, silicon and magnesium, combined with lesser amounts of iron, aluminium and calcium along with even smaller amounts of sodium and potassium, and more controversially, with perhaps significant amounts of hydrogen, carbon or sulfur (see below for a more precise accounting of proportions). Unlike the core, where the elements exist in their reduced state, the metallic BSE elements are generally combined with lighter elements (oxygen, sulfur, hydrogen) in what is termed an oxidized state where the metal atoms are depleted of one or more electrons. These depleted electrons are shared or appropriated to some degree by the other atoms in the molecule (a combination of atoms) and serve as part of the binding energy that holds the molecules together. These combinations of elements are known as chemical compounds or minerals. For example most of the mantle consists of some form of magnesium or ferro-magnesium silicate (together with calcium silicate) which, as the name suggests, is a combination of the three principal mantle elements, silicon, oxygen and magnesium. Combinations of these compounds/minerals are the main components of rocks (they can also contain smaller amounts of mineral liquids and gases). Although the BSE contains a significant amount of metallic elements, they are generally combined with silicon and oxygen to form rock minerals and rock minerals are the components of rocks. Hence we deduce that, in contrast to the metallic core, the BSE is rocky. One of the pieces of data that assist in our understanding of the earth’s interior is the estimate of the earth’s bulk density. The bulk density of the earth is calculated to be about 5.5 gm/cm3 (in comparison water is 1gm/cm3) but the density of the crust and exposed mantle rock is usually less than 3 gm/cm3, so a dense core is required to reach the overall density of 5.5 gm/cm3 , hence the iron core model. In addition, mantle seismic data reveals numerous discontinuities where the wave velocity steps up or down suggesting a change in density or composition at those levels. The composition of stony meteorites is also taken into account when modelling mantle composition. At normal temperature and pressure, rocks display a very wide range of densities. They can vary from about 0.3 gm/cm3 for calcium silicate to 3.4 gm/cm3 for gabbro. The first of these, calcium silicate (along with magnesium-iron silicate) features prominently in the lower mantle while gabbro is thought to constitute up to 90% of the ocean crust. The most significant elemental difference between the rocks/minerals of the crust and those of the mantle is their magnesium content. 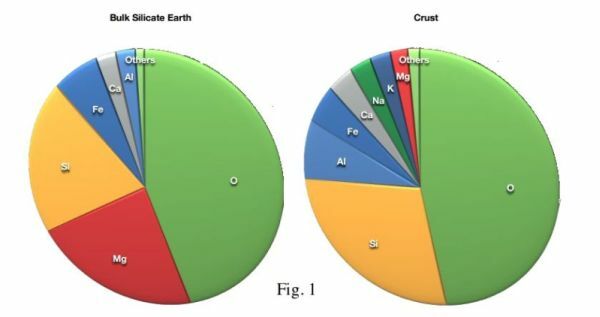 The chart below shows the composition of the mass of the bulk silicate earth (BSE) and the crust. The crust is about 1% of the BSE, so the BSE estimate can be taken as an analogue for mantle composition. The most abundant elements are oxygen and silicon. Note how oxygen is main component of both the crust and the mantle, it accounts for nearly half of the whole BSE by mass, and a surprising 94% of it by volume. Note also the large variation in magnesium (the red wedge is magnesium) between the mantle and the crust. There is a lot in the mantle, 22.8% and much less in the crust, about 2%. Note also that magnesium and silicon are very close in the periodic table of elements (separated only by aluminium) with atomic numbers of 12 and 14 respectively. The role of magnesium in mantle rocks is reflected in the names given to that class of rocks, the terms are mafic and ultramafic (see discussion below). 2. Mafic which combines the words magnesium and ferric). Mafics also contain silicate but in smaller proportion to the felsic rocks. A similar classification divides rocks according to their silica content. Those with high silicate content are labelled acid while low silicate rocks are labelled basic. The in-between ones are referred to as intermediate rocks. The igneous continental crust rocks are generally felsic while the ocean crust and the mantle rocks are generally mafic. But mafic rocks are also present in the continental crust as intrusions or ocean crust fragments or volcanics or even as exposed metamorphics. The magnesium and iron rich mafic minerals that are encountered on or near the surface are usually dark coloured, with densities often greater than 3 gm/cc. Some common types include olivine, pyroxene, amphibole, and biotite. Another mafic mineral, serpentine, is found as an alteration product (it is a hydrated form of the original mineral) of other mafic minerals like pyroxene and olivine. As such it occurs as a pseudomorph (meaning it retains the external shape of the original mineral) of the crystals it replaces while the actual crystal structure of serpentine itself is indistinct as it is composed of a fine admixture of about twenty different varieties. Serpentine is one of an important group of minerals called phyllosilicates that also includes the metamorphics mica, chlorite, talc, as well as the clay minerals. Phyllosilicates can be either mafic or felsic, their distinguishing feature being a silicon oxide ring structure, a bit like carbon’ benzine rings. Clay is one of the major constituents of sedimentary rocks and much of it has an authigenic origin. While on the subject of serpentine there are a couple of other points worth noting. First, it has an odd crystal habit where the crystal structure has either a fibrous structure (somewhat polymer like) or a fine aggregate or admixture of closely related crystal structures. The fibrous structure consists of a series of curved plates of serpentine crystal matrix joined together in one-up one-down fashion so as to form a corrugated or crimped fibre. The plates are curved due to different crystal structures on either side of the plates. Serpentine itself is actually a combination of about 20 different varieties or polymorphs with the three most important being antigorite, chrysotile and lizardite. Antigorite is especially important as it is about 13% by mass water. The metamorphics in general are inhospitable to plant life due to a lack of phosporus (P) and potassium (K) and no doubt the toxic metals, e.g. nickel (Ni) , chromium (Cr), cobalt (Co) they sometimes contain also take their toll on plant life. It is also somewhat ironic that a polymorph (same chemical composition, magnesium silicate, but different crystal structure) of what is thought to be the most abundant mineral in the mantle, the metamorphic mineral asbestos, is now shunned in the west as a dangerous carcinogen. Man made magnesium silicate is amorphous (meaning it has no crystal structure and is porous giving it a very high surface area to mass ratio, i.e it is very absorbent. It is considered to be biologically inert which is a good thing as it is ubiquitous as an anti-caking agent in salt. Common mafic rocks include basalt, dolerite and gabbro. Mafic rocks often also contain calcium-rich varieties of plagioclase feldspar. Mafic lava has a low viscosity due to the lower silica content in mafic magma whereas felsic lava, with a higher silicate content has a higher viscosity. At the surface this difference manfests as extensive sheets of mafic rocks like basalt. Another mafic mineral, silicate perovskite, is thought to be the main constituent of the lower mantle, possibly up to 93% by volume. Felsic minerals are silicates of the lighter elements such as aluminium, sodium, and potassium. Common felsic minerals include quartz, muscovite commonly known as mica, potassium-rich orthoclase feldspar, and the sodium-rich plagioclase feldspars. In some cases, felsic volcanic rocks may contain phenocrysts (inclusions) of mafic minerals. They are usually light in color and have densities less than 3 gm/cm3, generally about 2.6 gm/cm3. Although density is mostly related to the atomic mass of the atoms themselves, the density of a body is also affected by its electron structure. For instance, it is known that increased density is associated with the state of the spin structure of the electrons, in iron at least. The most familiar felsic rock is granite while another felsic rock, andesite is thought to form the majority of the base of the continental crust. As mentioned above, the crust consists of two main types of rock, continental crust and ocean crust. they differ markedly in age and composition and thickness, chalk and cheese really. The majority of ocean crust is thought to be less than 150 million years old while we measure the ages of crustal rocks in the hundreds of millions to billions of years old. It is thought that the older ocean crust has been replaced by more recent magma upwellings. The older crust, by dint of its slightly higher density and lower temperature is thought to sink into the depths of the mantle with some being reduced to magma and eventually be recycled to the surface via vulcanism and other types of intrusion. With the average crust thickness being measured in tens of kilometers and the mantle in thousands, a picture emerges of a thin skin covering a generally more pliable mantle, and compared to the interior this skin or crust is highly depleted in magnesium, …but enriched in silicon and with extra aluminium, sodium and potassium. The rocks of the crust can be roughly divided into the the silicate rich, felsic continental crust which has a diverse array of rock types, and the more homogeneous mafic ocean crust, 90% of which is composed of the mafic rock gabbro. The age of the oldest regions of the continental crust is measured in billions of years while the ocean crust is generally less than 150 million years old. 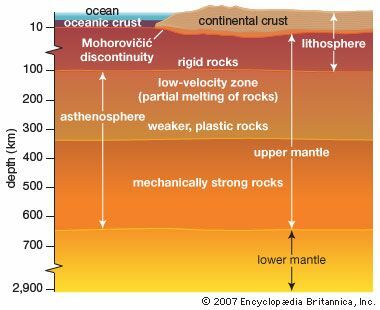 The following chart shows how the elemental composition changes as one transitions from mantle rocks to ocean and continental mantle rock derivatives. Note that continental crust rock is enriched in silica and to a lesser extent aluminium but depleted in magnesium. 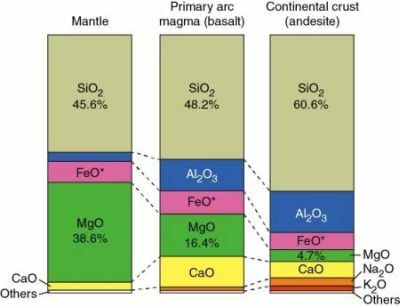 The chart below shows how the silicate content increases and the magnesium content decreases as one progresses from the mantle to the crust. The proportions of oxides of metals generally reflects the proportions of the metallic elements. The next diagram shows how rocks vary in mineral content and density. From left to right, the silicate content decreases while the density increases. There is evidence for the presence of water rich minerals in the upper mantle. It comes, somewhat ironically, from meteorite material which is rich in magnesium silicate. As already mentioned (but it bears repeating ?? ), the mantle is thought to be rich in magnesium whereas the crust and the core are depleted of magnesium, so the magnesium rich minerals in the meteorite are taken to be analogues of some of the mantle minerals. The water and other volatiles are thought to be introduced to the upper mantle via transport from the surface by subducted ocean crust. In fact all of the hydrogen and carbon in the mantle are thought to have their origin on the surface. This idea, that subducted or infiltrated surface water is the sole source of inferred mantle water, is being challenged. It has recently been suggested that water may be present in large volumes, in the upper mantle at least, and computer modeling suggests that some of the water may be authigenic in that it is formed in situ from a reaction that reduces silicate (an oxide of the metal silicon) thereby releasing oxygen which then combines with free hydrogen or reacts with a metal hydride to produce water. There is not much discussion about a possible source of hydrogen in the mantle. Mantle water and mantle chemistry in general is currently a very active field of research. The lower mantle is thought to be mainly composed of various analogues of magnesium silicate that can exist in the extreme temperatures and pressures of the region. The following quote gives a description of how the various stables phases of magnesium silicate analogues progress from one phase to the next. Here are the chemical formula of some typical mafic mantle minerals. Olivine, an upper mantle mineral, – a solid solution of Mg2SiO4 <-> Fe2SiO4. in variable ratios. Perovskite, a lower mantle mineral which, when combined calcium silicate may constitute 93% of this region – (Mg,Fe)SiO3. Due to its unusual properties perovskite is presently a very hot research topic. Another quote from Wikipedia explains the reasons for the attention. … Perovskite materials exhibit many interesting and intriguing properties from both the theoretical and the application point of view. Colossal magnetoresistance, ferroelectricity, superconductivity, charge ordering, spin dependent transport, high thermopower and the interplay of structural, magnetic and transport properties are commonly observed features in this family. These compounds are used as sensors and catalyst electrodes in certain types of fuel cells and are candidates for memory devices and spintronics applications. It is apparent that doped perovskite-like compounds have all the makings of the being next big thing in semi-conductor technology. The next diagram shows the mantle from a mineralogical perspective. Energy considerations have hardly been mentioned, but this is already too long so apart from this quote about energy matters in outer space, discussion here on the subject will have to wait. After saying that here is a bit of speculation about possible mass/energy processes that could occur in the underworld. ?? The prospect of a large proportion of mantle being composed of magnesium and calcium silicates and oxides doesn’t immediately bring accretion to mind, well not in my opinion at least, but rather some bulk production process. We presume phase transitions takes place from the outer to the inner layer as per the gravitational accretion model. Accretion requires that we think of the mantle processes as changes from the top down but a bulk authigenic process is more suggestive of a radial or centre out/bottom up process. In this view the crust becomes the first and oldest growth/inflation phase. A centre-out formation has a progression from more to less homogeneous material and the exothermic boundary reactions become endothermic and vice versa. 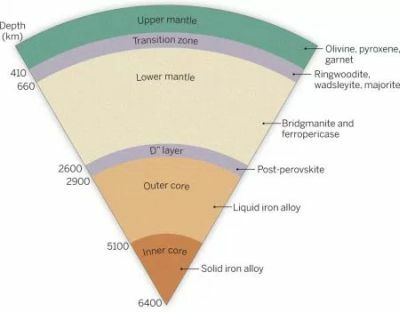 The centre-out view creates the prospect of some bulk conversion process where the oxygen, silicon and magnesium originate from the iron that is presumed to be in the core. Iron (26) can yield silicon (14) and magnesium (12) or three oxygen’s 8 with room to spare. Transformations may be sufficient to account for the significant volumetric increase/density decrease required. Note too that magnesium (12), aluminium (13) and silicon (14) follow one another in proton number. So one can imagine another possibility whereby silicon releases one two protons (as hydrogens (1) or helium (2) ) and transmutes into magnesium (12) or aluminium (13). And considering that oxygen is 93% by volume it is hard to avoid speculation about a variation in this ratio in an inflation process. Of course the possibility remains that such a process developed after accretion reached a critical mass that initiates the process. Finally the large variation in magnesium content between the crust and the mantle might provide an explanation as to why, if expansion has actually occurred, the mantle inflated while the crust cracked and split. Perhaps whatever it was that caused the inflation had something to do with the presence of, or production of, magnesium. and the cracking of the crust is due to no production or presence. This hypothetical process may initiate at different regions of the mantle at different times. We also have to consider that conditions may change over time, and we can’t altogether discount the existence of voids at some scale. P.S. There is a version with more links here and a discussion about the core here. Spheroidal objects in the universe get that way because they're not solid. They're gyroscopically revolving at an alarming rate at their center while their shell is slowly creeping to keep up. The shell does not produce a geomagnetic field as a cause so much as an effect of the magnetic field created at the center which drags the shell along. The reason why I say this is because I've begun to take the 'Flat Earth' believers a little bit more seriously since they have something to contribute to scientific opinion, but not exactly as they envision. I particularly enjoy their gyroscopic demonstrations purporting to explain why the Earth is flat. The problem is that it proves the Aether is flat and does nothing for proving their intended point! Their experiment validates a flat inertial reference frame. So far, so good. But this reference frame of theirs is not the Earth, since it is not the Earth which is generating its gravity, per se, because the solid Earth - as we know it - is hollow with something else very interesting at its core composed of something other than solid material along with a hollow space in-between its egg-shell surface and this core. I suspect it is this core which generates the Earth's magnetic field and drags the ferromagnetizable shell along at a sluggish pace of a mere singular revolution about its axis once per day. This is not enough to maintain the Earth's inertial reference frame by any means whatsoever. This is where the Flat Earth people have contributed to this situation, for they have questioned the strength of the Earth's inertial reference frame - not it's shape. And they have also questioned the source of the Earth's gravity. Both questions are sourced at the Earth's center of mass, but not due to its superficial mass, but due to its very influential energy source at its center which creates the Earth's inertia, thus apparently its gravity as well as its very slow rotation of its outer shell trying desperately to keep up. For without a much stronger inertial reference created by a rapidly rotating something or other at the Earth's center (dominating anything happening at its surface which we can see), this planet could not maintain its stable orbit around the Sun. It would wobble all over the place - not for lack of mass, but for lack of inertia which is a more accurate assessment. Thus, we could stipulate that it is due to mass that the Earth has any inertia at all. But like the Flat Earth people, we could just as easily suggest that an alternate viewpoint could just as easily be true: that a rapidly spinning nucleus is offsetting its lack of material mass while maintaining inertia at the same time. This rapidly spinning nucleus surrounded by emptiness and a thin, magnetizable shell allows for a pre-existent flat Aether as the ultimate reference frame. It is this ultimate reference frame within which operate planets and stars and hubs of galaxies which allows for their creation of their own spheroidal reference frames as a consequence to their very rapidly spinning, gyroscopic centers of energy. This rapid gyration at the centers of spheroidal galactic objects creates gravity along with their spheroidal curvature. Space does not bend. It is the field of gravity in the vicinity of a stellar object which bends actions nearby. The Aether, itself, is never bent; it is always straight (flat). And it is this flat condition of an ultimate reference frame that allows for curvature due to gravity as a short-range effect of stellar objects - not as a grand effect of space curvature. Space-curvature surrounding a stellar object would be ludicrous (if true) since this would allow for space - the ultimate reality of conventional physics - to be not so ultimate after all if it can be influenced by a teensy planet! If we replace 'space' and 'gravity' with 'gyroscopic activity', then we can safely say that it is gyroscopic activity which is being bent into a curved condition - not space. And what we suppose is gravity holding the Earth together is not gravity after all, but is instead the byproduct of the Earth's buoyancy. It's shell seeks a happy medium of altitude from its center of mass upon which to float. This allows for easy expansion should energetic forces in the Earth's interior should decide to change. That's not mass which we are inferring is undergoing expansion since we've been inferring mass as the cause of gravity all along. What we miss is that energy can build itself up from itself, alone, without any additional energy from outside itself. Only matter (material mass) needs any outside input to increase itself. 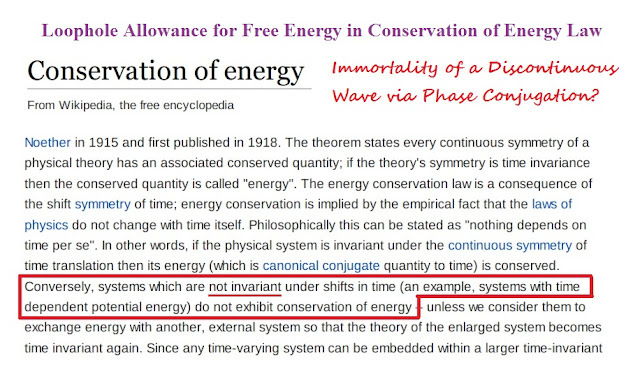 This is due to our collective oversight how fundamental time is equivalent to energy without any causative involvement of matter. I'll need to read through your post a few more times, it seems fun. I'll point out some stuff that I hope will help expand on your concept. "The Aether, itself, is never bent; it is always straight (flat)." Think of the aether as a fluid, filled with lumps and eddies. Atoms are aether in a concentrated form. In fact everything is aether. I've used this image of a Zen garden before. Look at the raked gravel as the aether flowing around planets. That's why the Michelson–Morley experiment only showed minor variations. They were measuring a flat, unchanging, field close to the surface. Look at the Dayton Miller experiment for further insight. Also look into the work of Yves Couder. The video shows what I mean by everything is aether. Think of the droplets he creates as atoms made of the aether they are dancing on. Sadly, your discussion of "flat earth" may trigger some crazy comments that might get a thread locked. HA! I've missed many an opportunity to comment on "flat earth" because it always seems to descends into "conspiracy theory" at some point, and my chance to point out the obvious fatal flaws was lost. We won't talk about the current group of "flat earth" people who get crazy with "conspiracy theory". Strip away the "conspiracy theory" and the whole thing falls apart. They literally use "conspiracy theory" to hide the fact that their concept does not work. I love the concept of "flat earth". It's great for story. I have a number of novel series that use the idea, but without the fatal flaws that cripple most of the other stories out there. - Terry Pratchett had his Discworld series, plus his novel "Strata" that inspired Discworld. - The novella "Missile Gap" by Charles Stross, with a disk world on an Alderson disk. - And of course Larry Niven's Ringworld series. All of these have the fatal flaw that they ignore physical reality. - A flat earth would be unstable. Put the slightest spin on the disk and all the atmosphere, water, soil would go spinning to the edge. - Put the slightest tumble on the disk, and the same problem occurs. Second: Everybody is also demonstrating two dimensional thinking. They forget that gravity is pulling across the disk as well as down. - If you have a flat earth, no spin, no tumble, gravity would pull all of the atmosphere, water, soil, into the center of the disk. There would be a hemisphere of wet soggy mess sitting in the center of the disk, not a nice surface to live on. - The Alderson disk that Stross wrote about, with the diameter of over a hundred million miles, would also pull everything into the center. There would be no surface to live on. - Look at Ringworld. The ring is a million miles wide, with the atmosphere supposedly held in by the walls at the edge of the ring. The problem is, a million miles of atmosphere would not lie flat against the ring. The gravity would pull all of the atmosphere into the middle of the flat ring. The water and soil would also pull together making a wet soggy mess in the middle of the flat ring. Remember: Any theory that you come up with has to match observed reality. As crazy as Growing Earth Theory sounds, it does match observable reality better than other theories. I love how this thread just keeps on growing, just like the Earth. HA! If they actually are able to bring back the mammoth it will not be as large as ten thousand years ago when gravity was less. Then they will have a puzzle on their hands. The billionaire founder of Paypal has funded an ambitious project to resurrect the woolly mammoth, reports suggest. Peter Thiel, who is worth $2.7billion (£2.1 billion), has reportedly put $100,000 (£77,000) of his own funds into a scheme that will modify elephant cells using DNA recovered from the bodies of frozen mammoths. The ancient beasts went extinct more than 10,000 years ago, with scientists unsure whether human hunting or climate change finished them off. HOW MIGHT SCIENTISTS REVIVE THE MAMMOTH? 'De-extincting' the mammoth has become a realistic prospect because of revolutionary gene editing techniques that allow the precise selection and insertion of DNA from specimens frozen over millennia in Siberian ice. The most widely used technique, known as CRISPR/Cas9, has transformed genetic engineering since it was first demonstrated in 2012. The system allows the 'cut and paste' manipulation of strands of DNA with a precision not seen before. Using this technique, scientists could cut and paste preserved mammoth DNA into Asian elephants to create and elephant-mammoth hybrid. Now Mr Thiel is said to have backed a top Harvard team attempting to bring the enormous mammals back to life. The claims were published in a book called 'Woolly: The True Story of the Quest to Revive One of History's Most Iconic Extinct Creatures', by American author Ben Mezrich. 'Just remember: It's only science fiction until we remove the fiction, then it becomes real,' one scientist told Mr Mezrich, according to MIT Technology Review. Mr Mezrich, who wrote a book about the founding of Facebook that was adapted into the critically-acclaimed film The Social Network, claimed Mr Thiel was having breakfast with Church when he asked to fund the 'craziest thing' he was working on. Mr Thiel chose the mammoth, turning down an anti-ageing scheme and an artificial intelligence project, according to the author. This is not the first time that the Harvard team has found its ambitious mammoth project in the spotlight this year. In February, the group announced that the scheme would take just two more years to produce the 'nearest possible thing to a mammoth' that could be created. The final beast would be a hybrid between an Asian elephant and a mammoth. It would be created from the DNA extracted from frozen mammoth carcasses retrieved from permafrost. If the Harvard University scientists succeed it will mark a turning point in plans to revive mammoths – by programming their genes into an Asian elephant. The bundle of cells would have genes for mammoth features such as shaggy long hair, thick layers of fat, and blood that is perfectly suited to flowing in sub zero conditions. The scientists have ambitious plans to grow it within an artificial womb rather than recruit a female elephant as a surrogate mother. Since starting the project in 2015, the researchers have increased the number of 'edits' where mammoth DNA has been spliced into the elephant genome from 15 to 45. Professor George Church, who heads the Harvard team, said: 'We're working on ways to evaluate the impact of all these edits and are basically trying to establish embryogenesis in the lab. 'The list of edits affects things that contribute to the success of elephants in cold environments. He added: 'Our aim is to produce a hybrid elephant/mammoth embryo. Actually, it would be more like an elephant with a number of mammoth traits. The woolly mammoth roamed across Europe, Asia, Africa and North America during the last Ice Age and vanished around 10,000 years ago. Their closest living relative is the Asian, rather than the African, elephant. The woolly mammoth roamed the icy tundra of Europe and North America for 140,000 years, disappearing at the end of the Pleistocene period, 10,000 years ago. They are one of the best understood prehistoric animals known to science because their remains are often not fossilised but frozen and preserved. Males were around 12 feet (3.5m) tall, while the females were slightly smaller. Curved tusks were up to 16 feet (5m) long and their underbellies boasted a coat of shaggy hair up to 3 feet (1m) long. Tiny ears and short tails prevented vital body heat being lost. Their trunks had 'two fingers' at the end to help them pluck grass, twigs and other vegetation. They get their name from the Russian 'mammut', or earth mole, as it was believed the animals lived underground and died on contact with light – explaining why they were always found dead and half-buried. Their bones were once believed to have belonged to extinct races of giants. Woolly mammoths and modern-day elephants are closely related, sharing 99.4 per cent of their genes. The two species took separate evolutionary paths six million years ago, at about the same time humans and chimpanzees went their own way. Woolly mammoths co-existed with early humans, who hunted them for food and used their bones and tusks for making weapons and art. Should we bring back the extinct woolly mammoth? This Thunderbolts video scared the hell out of me. Then I pulled out part 1 again. Yikes! Jupiter is "hollow"? Yikes! I want to hear more. allynh wrote: Jupiter is "hollow"? Yikes! I want to hear more. Here's what happens when you look at Trex in only one gravity. FILE - In this Friday, May 25, 2012 file photo, children stand near a life-size Tyrannosaurus Rex dinosaur model as it moves and growls in an interactive display at Field Station Dinosaurs in Secaucus, N.J.
Fifty years ago, if you'd asked the dinosaur experts, they would have told you that Tyrannosaurus rex was a speed freak - a giant predator that could outrun racehorses. The paleontologists would have pointed to its 3-meter hind limbs, leggy for even a big dinosaur, and described the creature as sprinting after prey at speeds of 40 mph. Previous estimates of T. rex's maximum pace ignored weight loads on the animal's bones. The new study took those into account, Manning said, and the result was "a bit like putting a governor on an engine." The scientists asked the model T. rex to move as fast as it could. At a run, the model indicated that T. rex's bones would snap because its legs would buckle under its weight. Unable to break into a sprint, it must have stepped its way through the Cretaceous Period. But that doesn't mean a 7-ton T. rex, at a full-bore walk, was anything less than terrifying. Elephants also don't run, which is to say they never have all four feet off the ground, and have been reliably clocked at about 10 mph. That's fast enough to leave a lasting impression. "The joy of an elephant charging you, trust me," Manning said, "it's one of those trouser-filling moments." John Hutchinson, an expert on evolutionary biomechanics at the University of London's Royal Veterinary College who has also estimated T. rex speeds, called this work a "very sophisticated computer simulation." The max estimate of 12 mph was in line with the low end of previous tyrannosaurus models. But like all computer simulations, this one came with certain assumptions baked in, Hutchinson noted. The study authors assumed that the animal's muscles were optimized to be as strong as they could, figuring that bone strength was the T. rex's weak point. Hutchinson said he was uneasy about that assumption, noting that "we don't understand the principles that govern speed limits in living animals." Manning acknowledged that the model could be improved: It gave a conservative estimate and did not account for features such as elastic tendons, which could bump up the T. rex's top speed. At this point, Hutchinson said, such a consensus has built around T. rex behavior that the dinosaur "is quickly running out of questions" for scientists to answer. The locomotion of other dinosaurs presents more interesting scenarios, in his view. He is investigating how the earliest dinosaurs moved - animals the size of house cats that would have had to scamper away from giant land crocodiles or end up as lunch. Manning is also curious about other dinosaur species, particularly the biggest of the bunch. "It's modeling a house walking across the plain," he said. "It is quite exciting." Hi, I am new from Japan. I found this thread, interesting! I thought expanding Earth theory in these days. There is Phase transition of crystal in mantle. increasing volume and it flows out to the surface. it may become granite plate. Crystal becomes 8 times volumes. I guess Earth was born in Jupiter. As some people may remember, I have a soft spot for supervolcanos. HA! Would a supervolcano eruption wipe us out? In the Bay of Naples, Europe's most notorious giant is showing signs of reawakening from its long slumber. Campi Flegrei, a name that aptly translates as "burning fields", is a supervolcano. It consists of a vast and complex network of underground chambers that formed hundreds of thousands of years ago, stretching from the outskirts of Naples to underneath the Mediterranean Sea. About half a million people live in Campi Flegrei's seven-mile-long caldera, which was formed by vast eruptions 200,000, 39,000, 35,000 and 12,000 years ago. The past 500 years have been fairly peaceful ones for Campi Flegrei. There have been no eruptions at all since 1538, and that was a comparatively small event that resulted in the formation of the "New Mountain", Monte Nuovo. But recent events suggest that this period of quiescence may be coming to an end. An acceleration of processes causing deformation and heating within the caldera saw the Italian government raise the volcano's threat level in December 2016. Fears are growing that magma deep inside Campi Flegrei could be reaching the "critical degassing pressure", where a sudden large-scale release of volcanic gases could abruptly inject heat into surrounding hydrothermal fluids and rocks. When this happens on a significant scale, it can cause catastrophic rock failure within the volcano, triggering an eruption. In line with this, a study published in May 2017 found evidence that the supervolcano has been building towards an eruption for decades. But the difficult question is not if, but when, and just how big an event this would be. "Campi Flegrei is in a critical state," says Antonio Costa of the National Institute of Geophysics and Volcanology in Bologna, who is part of a team monitoring the supervolcano. "In probabilistic terms, we expect something called a 'violent Strombolian eruption'. This is relatively small-scale to a supereruption. However, it's not easy to say if there will definitely be an eruption in the coming years. Campi Flegrei has not erupted during the timescale that it's been under observation, so we don't know entirely what to expect." A violent Strombolian eruption would blast molten rock and volcanic gases a few thousand feet into the atmosphere. It would surely be a major event, potentially requiring the evacuation of hundreds of thousands of people. But in the context of Campi Flegrei's past, it would be minor. The volcano's most notorious supereruption was the Campanian Ignimbrite eruption, which occurred some 39,000 years ago. It punched an estimated 300 cubic kilometres of molten rock 70km up into the stratosphere, along with an estimated 450,000 tons of sulphur dioxide. The ash cloud was carried as far as central Russia, some 2,000km away. The eruption occurred at a time when much of Europe was already going through a lengthy glacial period, and the consequences are thought to have devastated much of the continent for centuries. Entire swathes of land, including Italy, the Mediterranean coast and the entirety of eastern Europe, were left covered in up to 20cm of ash. This would have destroyed vegetation and created a vast desert. Much of Russia was immersed in 5cm of ash, enough to disrupt plant life for decades or more. "We know from chemical analysis that the ash contained fluorine, which has a strong impact on vegetation, and it would have produced a disease called fluorosis in animals," Costa says. "This would have had a knock-on impact on humans." In addition, the huge quantity of sulphur dioxide released would have created a volcanic winter. Sulphur dioxide backscatters the Sun's radiation in the upper atmosphere, preventing it from reaching the ground. The 1991 Mount Pinatubo eruption, one of the biggest of the 20th Century, did exactly this, temporarily lowering the global temperature by around 0.6C. But the Campanian Ignimbrite eruption may have had a far greater impact, with some scientists estimating that it decreased temperatures in Europe by as much as 4C, drastically altering the climate for many years. The timing of this huge eruption is suspicious, because many archaeologists believe that 39,000 years ago is roughly when our cousins the Neanderthals died out in Europe. It has long been speculated that the eruption triggered extreme environmental conditions across Europe, contributing to the extinction of the Neanderthals, at least in some regions. However, while the impact on the Neanderthals was surely significant, many scientists now believe it is unlikely that this single event was cataclysmic enough to wipe them out. Archaeological evidence suggests that Neanderthals persisted in parts of western Europe for some 10,000 years after the Campanian Ignimbrite eruption. This may be because of the way the ash dispersed. "After the eruption, Neanderthal archaeological sites are found only in France and Spain," Costa says. "This is probably because these two areas were not affected by the eruption at all, because the wind was blowing towards the east." There is even an argument that the eruption could have benefited the Neanderthals, by delaying the arrival in Europe of modern humans, who would have competed with them for resources. "To reach western Europe, modern humans would have had to cross the Middle East and the vast desert created by the eruption," says Costa. "It would have taken many hundreds of years for this land mass to recover." For now, it is unclear how much damage Campi Flegrei's last major eruption did. But it is far from the only supervolcano on the planet. Earth's geological history is a catalogue of apocalyptic-looking volcanic events. In south-west Colorado, there is a vast canyon approximately 100km wide and one kilometre deep. It serves as the legacy of one of the most explosive single events in the planet's history. La Garita Caldera was formed by an eruption nearly 28 million years ago, which expelled 5,000 cubic kilometres of molten rock. Fortunately for us, the tectonic plates in the area have since rearranged themselves, so a repeat event is impossible. But approximately 75,000 years ago in Indonesia, an eruption of similar scale occurred, and the supervolcano responsible remains active. Situated in the midst of a mountain range in northern Sumatra, the tranquillity and natural beauty of Lake Toba makes it a popular tourist location. But this lake is actually an enormous caldera, a footprint of the most extreme climatic event in human history. "The Toba eruption was frankly as big as any in the past tens of millions of years," says Clive Oppenheimer of the University of Cambridge, who studies some of Earth's biggest volcanos. "It's a particularly prominent one, because it's within the timeframe of modern humans, and the timing is quite critical, because it occurs around the time that humans come out of Africa and spread across Asia." But exactly what effect this had on the human race has been the subject of much controversy. In the 1990s, volcanologists discovered large ash deposits from Toba in marine sediments scattered across the Indian Ocean. The ash contained a chemical signature that could be traced back 75,000 years. Later studies found similar ash in the South China Sea, Arabian Sea and even in Lake Malawi, some 7,000km away from Toba. The colossal scale of the eruption means that volcanic gases from Toba are thought to have been ejected through both hemispheres of the Earth's atmosphere, causing them to circulate all around the world. But exactly which gases were emitted from Toba, and in what quantities, is crucial to knowing its impact on the climate and understanding what happened next. So far back in time, this is not straightforward. "There's an ice core in Greenland where they have a chemical record of how global temperatures went up and down over the past 125,000 years," says archaeologist Sacha Jones of the University of Cambridge, who has spent many years researching Toba. "Distinct layers of ice are laid down each year, and people have measured how much sulphate is in these layers. There is a large peak of sulphate, which seems to correspond to the timeframe of Toba." If the Toba eruption did indeed send vast quantities of sulphur dioxide around the world, scientists have predicted it may have sparked a volcanic winter, which blackened the skies and lasted some 6,000 years. In line with this, geneticists studying patterns in human mitochondrial DNA in the early 1990s, identified what appears to be a population bottleneck, which occurred somewhere between 50,000 and 100,000 years ago. Many were quick to make the link to Toba. But not everyone is so convinced. "Over the last 10 or so years, people have become more sceptical that Toba almost killed off Homo sapiens," Oppenheimer says. "Magmas can dissolve and hold things like carbon dioxide and water and sulphur in different amounts, depending on the volcano. And chemical analysis of ash from Toba has found that its magma can't actually hold very much sulphur." There is also something suspicious in the archaeological record. Indonesia, Malaysia and India are thought to have been blanketed in at least 5cm of ash from Toba, which undoubtedly affected vegetation and caused mass floods. Yet archaeological studies of ash deposits appear to show that humans were remarkably resilient to the environmental changes. "The main signs of human activity around this time are stone tools, such as hand axes and flint tips," says Jones, who has excavated sites in the Jurreru Valley in Andhra Pradesh, India. "When we excavated deposits above, through and below the Toba ash layer, we didn't really see much change at all in these Stone Age technologies before and after the eruption, which suggests that it didn't really cause any mass extinction." The key factor may be that most of the ash from Toba is believed to have fallen in the ocean, where it would have had only minimal effects on land-dwelling species like humans. However, Jones believes that the impact was still extremely severe for some communities. "Toba was an incredibly large eruption, so it will have had some massive effects in particular areas," she says. "The whole Pacific region in the immediate vicinity is very diverse, with lots of micro-climates. There's rainforest, desert, mountains, and people in certain areas may have suffered more than others." But what of Toba's future? Geologists and geophysicists who study the volcano remain concerned about its magma chamber, which could be reawakened if the Sumatra fault line, which bisects the island and runs through Mount Toba, became active. If it did, the only solution would be mass evacuation. But we do not even know how much warning we would receive. Located underneath Yellowstone National Park in the US, the Yellowstone supervolcano is one of the most actively monitored places on the globe. A variety of instruments, including seismometers to detect chains of earthquakes, GPS sensors to record how the ground swells and shifts, and even satellite images to detect pressure changes in the magma chamber, are all used to look for any noticeable trends in behaviour. Yellowstone has had three supereruptions in the past 2.1 million years. The first remains one of the largest of all time, producing 2,500 times the volume of ash as the 1980 Mount St Helens eruption. If Yellowstone erupted again, some scientists think it would have more devastating consequences than Toba, because the majority of the ash would fall on land rather than in the sea. "The last eruption of Yellowstone would potentially have put ash across both American continents," says David Pyle at the University of Oxford. "If you take a continental land mass and you suddenly cover it with 10cm of volcanic ash, all the organic matter and trees will lose their leaves and probably die. Animals will take in chemicals which are toxic to them. The ground will suddenly be much brighter than before, so a lot of the incoming solar radiation might simply be reflected back into the atmosphere, resulting in a lengthy drought." With water supplies clogged, electricity transmission lines failing and a complete disruption in ground transport, there would be an immediate crisis. "If Yellowstone, Campi Flegrei or Toba exploded, there would be huge economic impact across the globe, because of the way the world economy works now," Oppenheimer says. "We saw that after the relatively small Icelandic eruption [Eyjafjallajökull] in 2010. It affected supply chains for Volkswagen, because parts were coming from Japan. Global aviation could be affected for decades. If a lot of sulphur dioxide was released, this could precipitate monsoons and climate shifts, which could affect global food security." This would all be very problematic, but scientists are sceptical that a single explosive event like this could actually wipe out humanity. Instead, volcanologists say that another type of volcanic event may pose a much greater threat to our existence. Over the past 500 million years, all of the five largest mass extinctions in the fossil record have coincided with huge lava eruptions. These eruptions did not happen as single events, but as continuous outpourings going on for hundreds of thousands of years. They are known as flood lavas, and are caused by rising plumes of hot material from deep inside the Earth. The most violent flood lava eruptions are thought to be associated with continental drift. Only 11 have taken place in the past 250 million years, each shaping vast mountain ranges, plateaus or volcanic formations. One such flood lava event took place 66 million years ago and created a huge expanse of volcanic rock called the Deccan Traps, in west-central India. These eruptions may have contributed to the mass extinction that took place at this time, by releasing cocktails of gases that slowly acidified the oceans and altered the climate. The trouble is, nobody knows when the next flood lava event will occur. "We expect another flood lava event sometime in the next 50 million years, but I don't think anyone's got any idea where and when," Pyle says. Whether we are predicting the next supervolcano eruption or the next flood lava event, the problem is the same. The former has not been observed in recorded human history, while the last major flood lava eruptions occurred 10 million years ago in southern Canada, many millions of years before our species walked the planet. As such, while the world's volcanic hotspots are supremely well-monitored, we have no idea quite what to expect or how much warning we would receive before an event of such scale. Our tiny snapshot of monitoring time is dwarfed by volcanic cycles that can last millions of years. We have no real idea where we are on these cycles. It is entirely possible that nothing will happen in our lifetimes, or even in the next hundred thousand years. There is only one certainty about these eruptions: they will, eventually, happen. Now this, is my kind of dinosaur. What I love about the article, is people are finally going, OMG! how did they get this big. HA! In 2013, an old Argentinian shepherd named Aureliano Hernandez found a fossilized bone protruding from a rock at the farm where he worked. The remains of giant dinosaurs festoon Argentina’s landscape, and knowing the strict rules that govern such fossils, the farm’s owners—the Mayo family—contacted local paleontologists. By the time the team arrived, Hernandez had passed away. He never knew that as one of his final acts, he had discovered the largest dinosaur ever known. The fossil he had found was so big that it took two weeks to unearth it. It was a thigh bone, and the largest ever found—eight feet from end to end. There are photos of paleontologists lying next to it for scale, and they look like bemused pixies, their bodies and imaginations dwarfed by what they had found. The bone clearly belonged to a sauropod—a long-necked dinosaur like Brontosaurus, Diplodocus, and Brachiosaurus. Specifically, it was one of the titanosaurs—the last-surviving group of sauropods, and likely the biggest of them. But even known titanosaurs didn’t have thighs that big. Team leaders Luis Carballido and Diego Pol from the Egidio Feruglio Paleontology Museum (MEF) estimated that the bone’s owner would have stood 130 feet from nose to tail, and tipped the scales at 77 tons. Speaking to journalists, they compared it to 14 elephants, a seven-story building, and two trucks (with trailers) parked end to end. News of the new titan spread quickly. Last January, a cast of the sauropod went on display at the American Museum of Natural History, while legendary naturalist David Attenborough released a documentary about its discovery. And now, Carballido and his team have finally published an official scientific description of the dinosaur. They’ve also given it a name—Patagotitan mayorum. The first half refers to the Patagonian region where the dinosaur was found. The second half honors the Mayo family who kindly welcomed the scientists onto their land and into their kitchen. After careful analysis, the team think that Patagotitan is slightly smaller than they previously thought—69 tons or so. But even after that downsizing, it’s still twice as heavy as more familiar giants like Brachiosaurus and Apatosaurus, and 10 percent bigger than the previous record-holder—another Argentinian titanosaur called Argentinosaurus. For now, it’s the biggest dinosaur for which we have accurate measurements, and perhaps the biggest land animal that ever lived. Patagotitan cast, in a hangar. D. Pol. Patagotitan lived during the Cretaceous period around 101 million years ago. And for some reason, it frequented the area that eventually became the Mayo family’s farm. Carballido and Pol’s team returned to the site more than a dozen times, disinterring every fossil they could find. In the process, they built a road and partially removed a hill. Eventually, they recovered bones from at least six Patagotitan individuals. And their bones reveal that they were in their prime—young, still growing, and not yet at their full adult size. Carballido thinks that these individuals all died at different times, but he has no idea why they all died in this one place. He found the teeth of many meat-eating dinosaurs around the site, but he doubts any predator could have tackled such gargantuan prey. “They were too strong,” he says. “It would have been too risky for a carnivore.” Whatever their reasons, their attraction to this one place meant that Carballido’s team eventually uncovered more than 200 Patagotitan bones, covering most of the animal’s skeleton. “The most amazing moment for us was realizing that the dinosaur is not only large, but also more complete than any other titanosaur,” Carballido says. It’s ironic that scientists have found very little of the largest animals to have walked the land. We only know that Argentinosaurus existed based on a few handfuls of bones—some vertebrae, ribs, and leg bones, most of which are incomplete. Puertasaurus, another contender for the record books, is known from just four vertebrae. There are near-complete skeletons for some titanosaurs like Futalognkosaurus, but these were smaller species that weighed in at just 50 tons or so. The true colossi of the dinosaurs are hard to come by. As science writer Brian Switek once wrote, this means that “prehistoric creatures ballyhooed as ‘the biggest ever’ upon discovery have a tendency to shrink by time of publication.” Ultrasaurus, which was supposedly the biggest dinosaur during my childhood, turned out to be a mish-mash of other species. Bruhathkayosaurus, a possible Indian titanosaur, was claimed to be bigger than Argentinosaurus, but based on some poorly described fossils that were lost in a monsoon flood. And Amphicoelias is the most ludicrous supergiant of all—a sauropod that’s “known” from a fragment of a single vertebra, which was either lost or destroyed a century ago. To deal with these uncertainties, Carballido and Pol’s team used two separate methods to work out how heavy Paragotitan was. First, they used an equation that estimates an animal’s mass based on the circumference of its femur (thigh bone) and humerus (upper arm bone). “These are the two most important bones for moving the animal,” and the most likely to reflect its actual weight, says Carballido. The equation gave an estimate of 69 tons, with a range of 52 to 86. Second, the team fleshed out a three-dimensional model of Patagotitan’s skeleton, and calculated its volume to then estimate its mass. As it often does, that technique gave a similar but slightly smaller range—45 to 77 tons. By comparing their new discovery to the bones of other sauropod species, the Argentinian team could reconstruct the group’s evolutionary history. They think that sauropods were stable in size for much of their history, with most species weighing between 12 and 20 tons. But at some point, one group of titanosaurs—the lognkosaurs—became exceptionally huge, tripling their mass and reaching the 38-to-60-ton bracket. This was the group that gave rise to Argentinosaurus and Patagotitan. Hi, you see that such dates as 200,000, 39,000, 35,000 and 12,000 years ago have no significance if their datings are rubbish. Thus these eruptions could have been caused by planetary interaction or other electrical effects. Which makes it very likely that such supervolcanos are just leftovers from pretty big electrical discharges. And so probably only superwaves could cause large eruptions now. However they do remain weak spots if magma moves. They see meteorites when there were electric discharges. Similarly they see supervolcanos when there were electric discharges. The Field Museum in Chicago said on Wednesday it will take down and remount the 40-1/2-foot-long (12.3-meter) Tyrannosaurus nicknamed Sue, perhaps the world’s most famous dinosaur fossil, in a way that embodies the latest understanding of this ferocious Cretaceous Period predator. The big T. rex will move to a new exhibition space in the museum, while a cast of the skeleton of the largest-known dinosaur, Patagotitan mayorum, will take the spot Sue now occupies in the museum’s Stanley Field Hall. Patagotitan, a long-necked, four-legged plant-eater that was 122 feet (37.2 meters) long and weighed 70 tons, lived in Argentina 100 million years ago, more than 30 million years before T. rex stalked western North America. The biggest land animal on record, it was a member of a dinosaur group called titanosaurs. The museum next spring will unveil the fiberglass Patagotitan skeleton, which is being cast from fossils of seven Patagotitan individuals, and for two years will display some of the genuine fossils, including an 8-foot (2.4 meter) thighbone. Named for the woman who discovered the fossils in South Dakota in 1990, Sue is the largest, most complete and best-preserved Tyrannosaurus rex ever unearthed. The museum bought the fossils at auction for $8.4 million. Sue will be taken down in February and put up again with noteworthy changes in anatomy and stance in its new exhibition hall in spring 2019, museum scientists said. “We are making several adjustments to the skeleton to reflect new and improved knowledge,” said paleontologist Pete Makovicky, the museum’s associate curator of dinosaurs. The most striking change, Makovicky said, will be the addition of gastralia, bones resembling an additional set of ribs spanning the belly that may have provided structural support to help the dinosaur breathe. Adding these bones will illustrate just how massive Sue was and that it boasted a bulging belly, he added. The scientists concluded that the bone mounted as Sue’s wishbone was misidentified in 2000 and they will replace it with the dinosaur’s actual wishbone, or furcula, the fused collar bones typical of meat-eating dinosaurs and their evolutionary descendants the birds. They also will adjust the ribs to produce a slimmer, less barrel-shaped chest, and arrange the right leg so Sue is not crouching as much. “Often when you do something as expensive as mounting a vertebrate fossil skeleton for display you only get one shot at it. I‘m happy we’re going to fix and update this incredible fossil,” said paleontologist Bill Simpson, who heads the museum’s geological collections. Makovicky noted the accumulation of knowledge about T. rex and its cousins since 2000. “We now know more about tyrannosaur lifespans -- around 30 years; how they grew -- very fast as teenagers; and using computer models of Sue we revised their body mass upward to 9 or more tons, from 5 to 7 tons,” Makovicky said. Ongoing research is examining the molecular composition of cartilage preserved in T. rex bones, and recent studies have shown it possessed the most powerful bite of any land animal ever, Makovicky added. When the Patagotitan skeleton is mounted, visitors will be able to walk underneath it and touch it. Its head will reach the museum’s second-floor balcony nearly 30 feet (9 meters) up. Another Patagotitan skeleton is displayed at the American Museum of Natural History in New York. The museum said a $16.5 million gift from the Kenneth C. Griffin Charitable Fund, established by the founder and chief executive of hedge fund firm Citadel LLC, enabled it to carry out Sue’s makeover and add the Patagotitan. The changes coincide with the museum’s 125th anniversary in 2018. This is the video in the article. Watch it to see the size comparisons, with humans. I've started watching the videos on YouTube and spotted this video by James Grist. The video is interesting, but I can't find the actual software. When I look on Google, I find sites to download the software, but it's just the video not the software. They want you to turn off Ad Blocker. Don't, it's not worth the garbage that pops up on the screen. HA! Yellowstone, and supervolcanos, started my search for alternative answers to consensus science. Notice the timeframes and the constant reassurance that these things won't happen in "our" lifetime. Beneath Yellowstone National Park lies a supervolcano, a behemoth far more powerful than your average volcano. It has the ability to expel more than 1,000 cubic kilometers of rock and ash at once — 250,000 times more material than erupted from Mount St. Helens in 1980, which killed 57 people. That could blanket most of the United States in a thick layer of ash and even plunge the Earth into a volcanic winter. Yellowstone’s last supereruption occurred 631,000 years ago. And it’s not the planet’s only buried supervolcano. Scientists suspect that a supereruption scars the planet every 100,000 years, causing many to ask when we can next expect such an explosive planet-changing event. To answer that question, scientists are seeking lessons from Yellowstone’s past. And the results have been surprising. They show that the forces that drive these rare and violent events can move much more rapidly than volcanologists previously anticipated. The early evidence, presented at a recent volcanology conference, shows that Yellowstone’s most recent supereruption was sparked when new magma moved into the system only decades before the eruption. Previous estimates assumed that the geological process that led to the event took millenniums to occur. To reach that conclusion, Hannah Shamloo, a graduate student at Arizona State University, and her colleagues spent weeks at Yellowstone’s Lava Creek Tuff — a fossilized ash deposit from its last supereruption. There, they hauled rocks under the heat of the sun to gather samples, occasionally suspending their work when a bison or a bear roamed nearby. Ms. Shamloo later analyzed trace crystals in the volcanic leftovers, allowing her to pin down changes before the supervolcano’s eruption. Each crystal once resided within the vast, seething ocean of magma deep underground. As the crystals grew outward, layer upon layer, they recorded changes in temperature, pressure and water content beneath the volcano, much like a set of tree rings. “We expected that there might be processes happening over thousands of years preceding the eruption,” said Christy Till, a geologist at Arizona State, and Ms. Shamloo’s dissertation adviser. Instead, the outer rims of the crystals revealed a clear uptick in temperature and a change in composition that occurred on a rapid time scale. That could mean the supereruption transpired only decades after an injection of fresh magma beneath the volcano. The time scale is the blink of an eye, geologically speaking. It’s even shorter than a previous study that found that another ancient supervolcano beneath California’s Long Valley caldera awoke hundreds of years before its eruption. As such, scientists are just now starting to realize that the conditions that lead to supereruptions might emerge within a human lifetime. “It’s shocking how little time is required to take a volcanic system from being quiet and sitting there to the edge of an eruption,” said Ms. Shamloo, though she warned that there’s more work to do before scientists can verify a precise time scale. Dr. Kari Cooper, a geochemist at the University of California, Davis who was not involved in the research, said Ms. Shamloo and Dr. Till’s research offered more insights into the time frames of supereruptions, although she is not yet convinced that scientists can pin down the precise trigger of the last Yellowstone event. Geologists must now figure out what kick-starts the rapid movements leading up to supereruptions. “It’s one thing to think about this slow gradual buildup — it’s another thing to think about how you mobilize 1,000 cubic kilometers of magma in a decade,” she said. As the research advances, scientists hope they will be able to spot future supereruptions in the making. The odds of Yellowstone, or any other supervolcano, erupting anytime soon are small. But understanding the largest eruptions can only help scientists better understand, and therefore forecast, the entire spectrum of volcanic eruptions — something that Dr. Cooper thinks will be possible in a matter of decades. An earlier version of a home page headline for this article misstated the location of a supervolcano that drives geological activity. It is beneath Yellowstone National Park, not Yosemite. My local PBS station has a great series called "Colores". They are finally putting their stuff on YouTube. This episode is about the supervolcanos that fill New Mexico, just waiting to blow. This is the same information, but from Forbes. The author got a bit more excited by the implications. HA! Once these events are given a short timeline, people start to pay attention. It also comes with a nice map showing the ash fall. Grand Prismatic hot spring in Yellowstone National Park. Beneath the beautiful Yellowstone National Park lies a supervolcano, a hidden a force of nature that has the potential to blanket the United States in ash and send the world into a volcanic winter. While scientists have studied Yellowstone's supervolcano extensively, the fact of the matter is there's not much we can do about it if/when the supervolcano erupts again. Albeit, that hasn't stopped NASA from trying to engineer a solution to the next supervolcano eruption. What scientists have relied upon is that when Yellowstone's supervolcano begins to rumble and its magma chambers begin to fill, we would have centuries to prepare for the devastating eruption. However, recent studies find that the speed at which the volcano can fill its magma chamber and erupt is on the order of a few decades. That means Yellowstone supervolcano could go from its usual activity like today to erupting in 2030's. How did scientists unravel the timing of the latest Yellowstone supervolcano eruption? As the magma chambers filled, portions of the magma were cool enough to solidify into rock. While they solidified or lithified, the minerals grew over time, creating bands of progressively younger mineral around older mineral. Scientists inspected the bands of these minerals and what they found is the last few bands of mineral formation recorded a sudden spike in temperature on the order of decades before mineral lithification stopped. Hence, the rapid increase in temperature on the order of decades represents the time required for a sudden injection of magma and release through an eruption. Highlighted areas are where ash beds have been identified from previous Yellowstone supervolcano eruptions. That's a scary thought for anyone that intends to understand and plan for action in response to the Yellowstone supervolcano eruption. To put the eruption into perspective, the volcano has the ability to spew 1,000 cubic kilometers of ash and rock into the air, which is approximately 250,000 times more than the 1980 Mount St. Helens eruption. This amount of rock and ash would cover most of the United States and could send the entire Earth into a volcanic winter. This event, similar to the large asteroid strike that wiped out the dinosaurs, sends enough dust into the atmosphere that it blots out the sun, potentially for years. Thankfully, there are no signs of imminent danger, with the last Yellowstone supervolcano eruption occurring 631,000 years ago. However, it's important for scientists to continue to study and understand the telltale signs of a volcanic eruption, particularly on this scale. Scientists will become better at predicting a future eruption. This will, hopefully, give Americans enough time to prepare as much as possible for what will be a catastrophic natural disaster. There was a fun film dramatizing Yellowstone, done by the BBC in 2005. It's on YouTube. Then here is one of my favorite parts from the movie 2012. I too would want to be on the mountain top with Charlie when Yellowstone blows. HA!